Meet the happy crafter who believes every mystery should be unraveled. Molly Pink's crochet group has a new mystery on their hands when they find a paper bag that contains a note that speaks of remorse, a diary entry of the sorrow of parting, and a complicated piece of filet crochet that offers an obscure clue in pictures. Things get even more complicated when they find the talented crocheter-murdered by a box of poisoned marzipan apples. 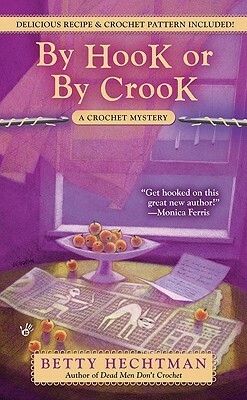 Betty Hechtman is the national bestelling author of the Crochet Mysteries and the Yarn Retreat Mysteries. When she isn’t writing, reading, or crocheting, she’s probably at the gym. She lives in Southern California. "Get hooked on this great new author." "Readers will admire the feisty, caring Molly."